For weld certification and qualification, Sawyer’s line of weld inspection and tensile testing equipment is hard to beat, and the 25 Ton Guided Bend and Tensile Tester is no exception. It provides accurate, dependable weld-quality testing, whether used in the shop or in the field. The operator of this strap bender can set the machine to perform either an API or ASME test in mere minutes to complete any weld certification and weld inspection needs you may have, and the dual frame allows compression testing and tensile testing. For even more versatility, this iron horse tester comes with the Sawyer Liquid Gauge System and Enerpac Hydraulics, allowing it to accurately perform tests up to 51,500-pounds. Optional accessories for the 25 Ton Guided Bend and Tensile Tester, include .250 (1/4″) ASME, .500 (1/2″) ASME and 1104 API die and plunger sets and an Enerpac electric or pneumatic pump. This iron horse tester is sure to meet all your bend and pull tensile testing equipment needs, including ductility tests, tension tests and qualitative tests. Sawyer’s line of weld test equipment is known for durability and reliability, and the Guided 25 Ton iron horse tester is absolutely bullet proof. Offering improved plating and powder coating for corrosion resistance, it will stand the test of time. 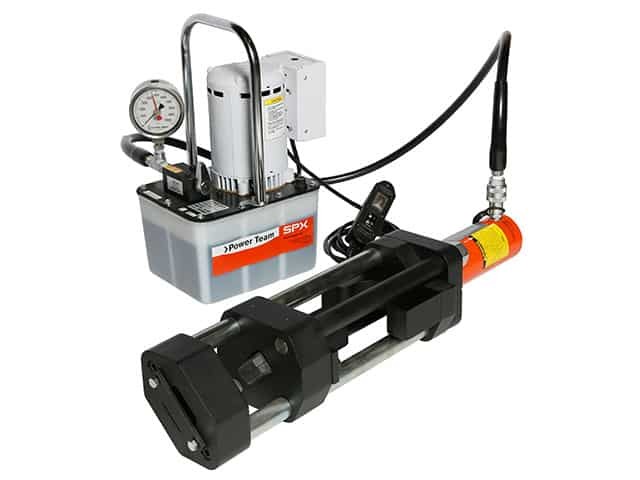 With a high level indicator gauge, two speed manual pump, pulling jaws, steel carrying case, and .375 (3/8”) ASME die and plunger set that comes standard, this piece of portable destructive weld testing equipment offers the ability to safely perform guided bend and pull testing with a high level of mobility and versatility. For the best in weld inspection and weld certification testers, look no further than Sawyer’s destructive weld testing equipment. Power Team Electric Pump attachment for the 15 Ton Guided Strap Bender and 25 and 50 Ton Guided Bend and Tensile Testers. Power Team Foot Pump attachment for the 15 Ton Guided Strap Bender, the 25 and 50 Ton Guided Bend and Tensile Testers. Air driven hydraulic pumps are easily operated by hand or foot.